On changing posture from a supine position to standing, the microvasculature of the lower limbs vaso-constricts. This is the veno-arteriolar reflex (VAR) and the associated change in blood flow can be assessed by laser Doppler. The VAR is a mechanism that protects the delicate microvasculature of the lower limbs from damage due to excess hydrostatic blood pressure. The impairment of the VAR is seen in diabetes and more recently in primary biliary cirrhosis. Although monitoring can be used, imaging will provide multiple LD flux measurements that can be averaged. The VAR index is Flux average in the dependent position / Flux average in the supine position x 100%. Observed values for VAR: normal healthy = 18%; diabetic without neuropathy = 29%; diabetic with neuropathy = 54%. 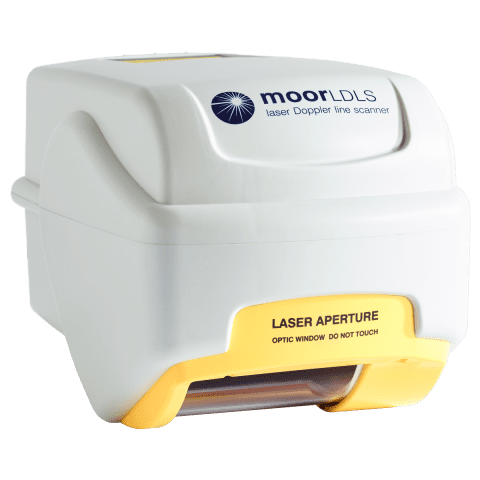 The VAR can be assessed by imaging if measures are taken to enable the scan head to move by the 50cm change in height and any angle adjustments during change of foot position; the moorLDLS2 on an MS3b mobile stand would be an appropriate choice. 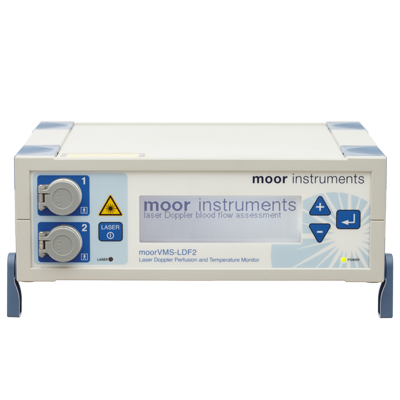 The moorVMS-LDF with a VPIT/7 probe can also be used in conjunction with moorVMS-PC software. Oldfield MA and Brown MD. Evaluation of the Time Course of Vascular Responses to Venous Congestion in the Human Lower Limb. J Vasc Res 2006; 43: 166–174. Rayman G, Hassan A, Tooke J E.
Blood flow in the skin of the foot related to posture in diabetes mellitus. British Medical Journal, 1986, 292, 87-90. Saucy F, Dischl B, Delachaux,A, Feihl F, Liaudet L, Waeber B and Corpataux J-M. Foot Skin Blood Flow Following Infrainguinal Revascularization for Critical Lower Limb Ischemia. Eur J Vasc Endovasc Surg 2006, 31, 401–406. Shore A C, Price K J, Sandeman D D, Tripp J H and Tooke JE. Posturally induced vasoconstriction in diabetes mellitus. Arch Dis Child 1994; 70: 22-26.